100% Merino wool base layer - 200gm weight. Wool is an amazingly complex natural fibre that insulates, regulates temperature and is highly absorbent. EDZ Merino base layers are made from the finest merino wool which is soft next to the skin and comfortable to wear. Easy to live with as they are machine washable, shrink resistant and durable. 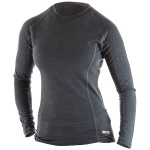 When it comes to performance these are as good as any 200gm Merino baselayer currently available. Based in Cumbria, England EDZ produce high performance base, mid and outer layers, for both outdoor enthusiast and motor bikers alike, their products contain only the best materials, features and workmanship required to ensure the most extreme level of performance.